After 30 years on the Internet, it is quite obvious that digitization is one of the megatrends. With this world in mind, Jesuit schools are addressing the issue of digitisation to make pupils fit for the future. It is quite obvious that digitization is one of the social megatrends today. How exactly our society will change and what the future of today's pupils will really look like remains not clear. However, it seems clear that digital networking and communication possibilities will continue to increase, that the Internet will continue to gain in importance (Internet of Things, IoT) and that in the not too distant future occupations will be needed that we do not yet know today what they are called. 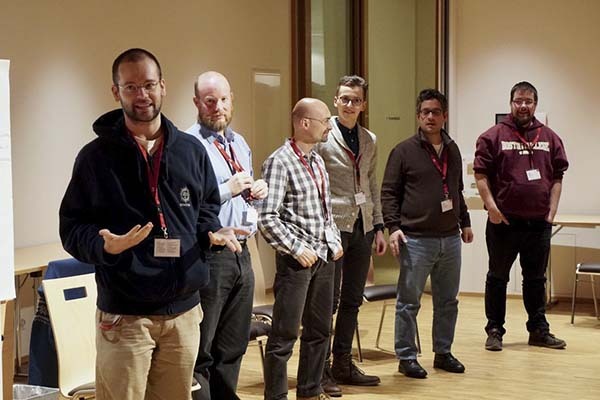 With regard to this future world, some Jesuit schools are currently implementing the project "Digital Leadership Education" together with the Centre for Ignatian Pedagogy (ZIP). The aim of this project is to take up the challenges of digitalization and at the same time - in the tradition of Ignatian pedagogy - to strengthen the personality of pupils. Young people should be empowered to play an active role in social discussions about the role of digitization in our lives. In other words, it is about personal development for the digital future. What does that mean in concrete terms? In the first workshops, school-relevant areas were identified and correspondingly three sub-projects were formulated in which the project wants to start: (1) The use of learning tools and levels of reflection, (2) the networked design of teaching situations and (3) artificial intelligence and robotics. The approaches in these subprojects will be described in more detail below. The use of learning tools and levels of reflection In some subjects, the use of digital learning tools can support teaching. In the "Bettermarks" programme, for example, learners are given additional tasks in the subject of mathematics, with supportive explanations of possible solutions, and the teacher can individually monitor the learning progress of individual pupils. The "Navigium" program, which can be used in Latin for vocabulary learning and grammar exercises, works according to a similar principle. The use of these programs enables, in addition to the direct benefit, various levels of reflection such as questions about motivation and independence as well as the role of an "omniscient teacher". The networked design of teaching situations This subproject deals with the effects of digitisation on teaching methods. Specifically, some selected subjects will be taught according to the "Flipped Classroom" method. Here the learning sequence is shifted before the actual teaching time by pupils watching learning videos or other digital materials to prepare for the lesson and editing them at their own pace. In the classical classroom, the teacher then increasingly assumes the role of a coach. The critical handling of digital content as well as the creation of such content is the focus of this subproject. Artificial Intelligence and Robotics The developing of robots related to artificial intelligence will change many areas of our society, such as self-controlling vehicles and care support systems, to name just two. In the discussion with Lego Mindstorms, the structure and functionality of robots should become clear and their social effects reflected. Experiences from workshops with different teaching staffs show that digitization actually affects all subject areas of a school in very different ways. A first central question is the handling of data, which can also be addressed in a subject such as sports by means of so-called fitness apps, which comprehensively collect the performance and other personal data of a user. The second central question on which the schools want to work together across the board is how prevention work can wisely and comprehensively take up the digital challenge and enable good cooperation at schools even in the age of omnipresent smartphones. Author: Kai Stenull Deputy Director Education of the Heinrich Pesch House, Master of Political Science and Eastern European History, Focus: Political youth education, economic and social ethics Picture: Christian Modemann SJ in a classroom oft he Aloisiuskolleg Bonn-Bad Godesberg. How can young people find spaces for God if God is everywhere? Where in university should we speak about God and where do we speak to God? Chapels, meeting rooms, parks, classrooms... are we shaping spaces for God? These are the questions in the JUPC meeting in Dresden, Germany, at the end of February. 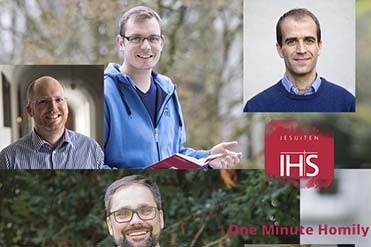 Jesuits in University Pastoral Care (JUPC) is a network of chaplains who gathered yearly to share initiatives and good practices, and to foster collaboration among Jesuit and friends chaplains who works on campuses in Europe and Near East. 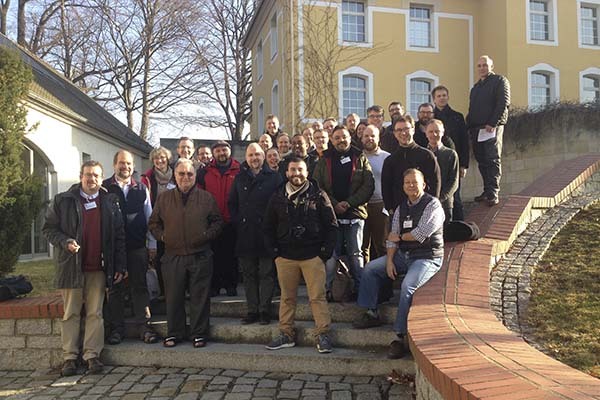 JUPC meeting in Dresden finished yesterday (28th February). We will soon upload a complete article on this event. Nuremberg - In response to the initiative by the German and French finance ministers (beginning December) to convert the financial transaction tax into a share tax, the campaign "Tax Against Poverty - Financial Transaction Tax" responds by stopping its campaign activities. 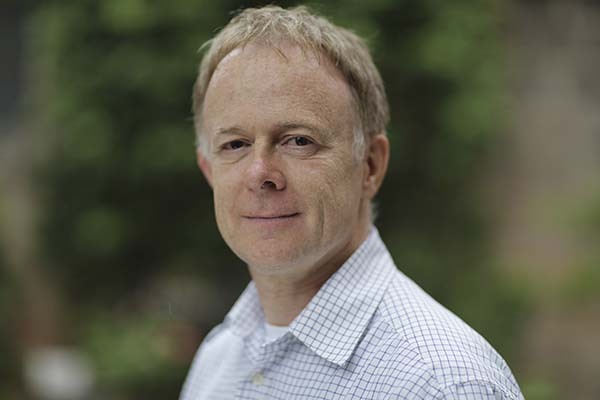 Father Jörg Alt SJ, who initiated the campaign in 2010, comments on this initiative: "The campaign was launched by the Jesuit mission with three aims: the financial industry, one of the causes of the financial crisis, to demand a modest contribution to coping with the costs of the crisis; to use the proceeds of the crisis to alleviate poverty and the consequences of climate change; and to use the tax to make the trade in questionable financial products unprofitable and thereby to push it back. The Franco-German project thwarts our intentions: It burdens the real economy and protects the financial industry. And instead of fighting poverty and climate change, it is now to be financed in a Euro zone budget. While Finance Minister Wolfgang Schäuble had still advocated the tax for reasons of justice and strengthening democracy, the current Franco-German proposal is a slap in the face for all those who have been committed to tax justice for years. We cannot legitimise this approach, which is why we also support the cessation of campaign activities. But: "The next financial and banking crisis will certainly come - then we will speak again". Essen lays in the center of the Ruhr Area. Every day in the Abuna Frans House the message of Christmas works, and Ludger Hillebrand SJ feels like in Bethlehem: "There! I stand at the door and knock. Whoever hears my voice and opens the door, to which I enter and eat with him and he with me." 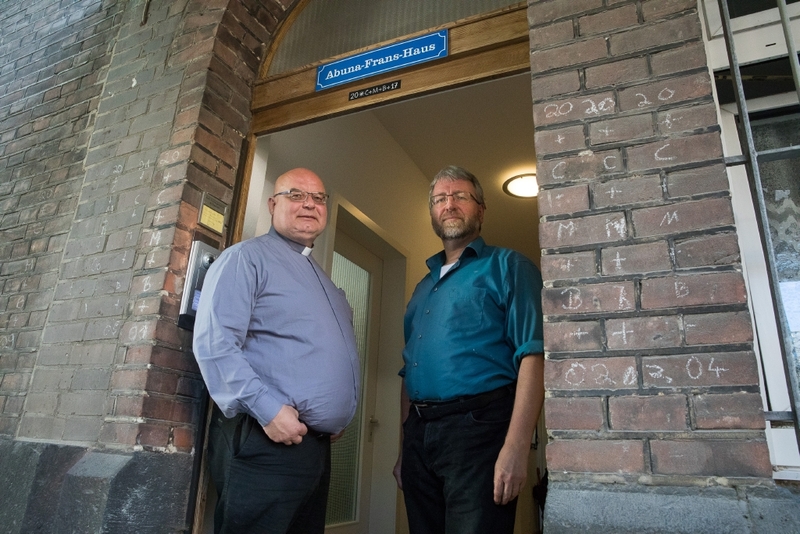 (Rev 3:20) Father Lutz Müller and I have been running the Abuna-Frans-Haus for 20 months, a flat-sharing community of eight refugees and us Jesuits. Two housemates came from the street. First of all a short conversation over the phone with the person who visited them. Emergency situation! So, rooms cleaned and vacuumed, bed made, towels laid out, received. At first we didn't know why they had landed on the street. We simply opened the door and had tea with them. We learn the life story of all our roommates bit by bit. One of them told it to us only after more than a year. It took him so long to gain trust in us. Two hours of narration for over three years of escape from Africa via Greece to us. We normally don't ask about the reasons for the flight and the exact way to Germany. We wait adventitiously what comes and help where help is requested. The one former homeless Syrian knocked on my door late in the evening. He wanted to speak. At that time he spoke almost no German, I do not speak Arabic. I told him clearly that I did not understand him. He didn't care. He talked in tears. Just go for it and I listened as far as I could. What did I learn from that? I don't understand everything, can't understand everything at all, probably doesn't have to understand everything either. Simply being there, opening the door, facing the other, is already light in the darkness of this world. "His own did not receive Him" In the Gospel of Christmas according to John one can read: "He came into his property, but his own did not receive him". In recent years the borders have become denser, higher, more insurmountable. Our Christian Europe lets Africans drown in the Mediterranean and cooperates with dictators so that no one unexpectedly stands before our doors. As the fourth largest arms exporter, we earn a lot of money with many wars. And we wonder why people flee to us. In the year 2016, the repeatedly quoted climax of the alleged refugee crisis, one refugee per hundred Germans. Converted this means that the individual German could only eat 99% of his breakfast! What a drama! And in the meantime many of them have already been deported again, travelled back, or moved to families in other EU states. The policy of isolation and deportation is having an effect. What happens to the refugees who came to our house? One, a civil engineer from Syria, found a job as a civil engineer in Essen. A young man from Guinea is doing an apprenticeship as a baker; another is doing an apprenticeship as a restaurant specialist. All the others take language courses and take part in qualification courses for their future work. And we who, with the help of congregations and orders and countless volunteers, have opened the door for eight people? We meet silent and eloquent, young and old men. One of our roommates is called Jesus, two are called Mohamed and one is called Joseph. After months of living together, we understand each other better and we don't have to ask so many questions. Interreligious and international coexistence needs time and a lot of patience. On the way we enjoy the common food from the cultural areas of Africa and Arabia. "But to all who received him, he gave power to become children of God, to all who believe in his name. Like children, we do not understand much in all its depth, drama and tragedy. But like children, we are happy when the Congo resident helps the Lebanese. And when a young roommate lets the Internet rest and goes shopping with an old one. Many small effective lights. Like in Bethlehem. Hallelujah.